Wedding Wednesday: So much sewing to do! 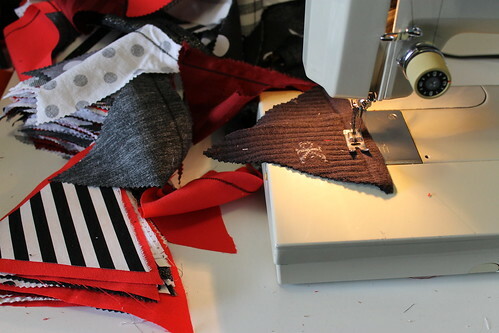 As I mentioned previously, we've been cutting out fabric triangles for bunting. Now that we have thousands (yes, thousands) of triangles cut, it's time to start putting them together. We shuffled the various bits of thrift store bed sheets, fabric leftovers and random rags (there's even some old socks in there!) with the help of Chris' best man, and put them into stacks of 120 triangles.